Jeff Mann will attend the North American Bear Weekend in Lexington, KY February 2-5, 2017 where he will read from his new novel, Country, on Saturday, February 4, 2017 at 1:00 PM in the Saxony Room. 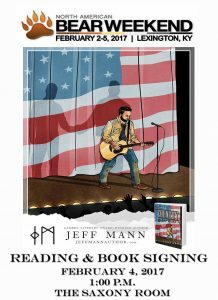 Jeff will also offer a sneak peak at his new graphic novel, Wolf Moon/Hunger Moon. What do a vampire, his mortal cub lover, and a really hot bear (who also happens to be a werewolf) have in common? Guess you will have to come over to Jeff’s table in the vendor section and check it out! Jeff will have lots of goodies at his table. You can place your pre-order for Wolf Moon/Hunger Moon or pick up one of Jeff’s other books.